Mistletoe is easily seen in the rainforest clearing at Chambers Wildlife Rainforest Lodges. Mistletoes, like Strangler Figs, start up life in the canopy. Mistletoes are partial parasites, that is they derive their water and nutrients from the host tree to its detriment, but their green leaves carry out photosynthesis, as do all green plants, to produce additional foods. Mistletoes have evolved a fascinating way of ensuring the dispersal of their fruits. Mistletoe birds and other frugivores eat the soft mistletoe berries. The Mistletoe bird eats insects and therefore has a grinding gizzard. When eating the Mistletoe berry the bird is able to close the gizzard and shunt the soft, toxic seed quickly through its digestive tract. Within 25mins of eating the berry the Mistletoe bird passes the seed and if deposited on a suitable tree, this seed can germinate. 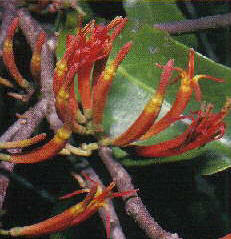 Many of the rainforest mistletoes, such as Dendrophthoe falcata, have spectacular large red flowers.